Just Released, "The Matheny Manifesto"
I just ordered my book copy of the recently released ‘The Matheny Manifesto’ the other day. Anyone coaching kids baseball should by all means do research the story about Mike Matheny’s adventures and experience into Little League Baseball with his own kids. Matheny is a former MLB catcher and now the Field Manager for the St. Louis Cardinals. Matheny’s outspoken truth and criticism of the parents and adults of youth baseball players brings so much sunlight on the dark side of youth sports. I hope Mike continues to use his powerful platform to beat the drum for the kids in the youth baseball forum. Matheny has responded to questions on his ‘manifesto’ in interviews and here is a sampling into his thoughts about youth baseball organizations and the adults. You say, “The biggest problem in youth sports is the parents.” Yes. When you ask kids who play sports at different levels, ‘What do you want your parents to do?’ The overwhelming majority say, ‘Nothing.’ Parents need to be a silent source of encouragement. So, no yelling or cheering at practices of during games? “Even yelling positive things like, ‘You can do it!’ adds pressure; Especially with the youngest kids. They don’t need that. They know you’re there and that’s enough. Thank you Mike Matheny! Spread the word folks. He makes a bunch of sense. How many times do the top pitchers also play shortstop on our youth baseball leagues and youth baseball tournaments? I think it is really rare to ever find the top pitchers not play shortstop, thirdbase and/or catcher. Naturally both pitcher and shortstop require the top arms so that is where the best armed kids in up playing. The problem that lurks in the mist of all this is your shortstop/pitcher is throwing hard, long and far very often without much rest. Here are some things I like to do to give the premium arm position players a little break. 1. Work out all your right-handed throwers on your team at shortstop. You will likely have a few more options of players who can fill in at shortstop (and thirdbase) at a pretty serviceable level if you do. Then you will feel more at ease and confident that your infield defense will be okay without your superstar. 2. Sit the pitcher out a few innings or the rest of the game rather than sending them directly to shortstop after they pitch. 3. Play the pitcher in less arm taxing, long-throwing positions. Try playing them at secondbase, firstbase or the outfield to give them more less-taxing throws. 4. Use them as designated hitter. 5. Back off on heavy throwing practices the day before and day after pitching. 6. Develop a deep pitching staff. Depth is your friend. Try to develop every player to be a pitcher. That way each pitcher pitches only one or two innings a game and no one gets beat up by pitching too much. 7. Put winning on the back-burner. In other words never put your players in danger of getting hurt because you think you need to win the game, pennant or tournament so terribly bad. Nothing is worth winning that bad where you selfishly, willingly and knowingly over-throw your players. Hope this gives you a few ideas to consider a reflection on the shortstop-pitcher situations, which are so common during youth baseball tournaments. 4-Day Free Coaching Course that starts you out right! If you are new to coaching or been around awhile, take advantage of this great deal. This will get your juices flowing and mind wandering. Get your ducks in a row now before you get too far along in the season. My email courses will get you up to speed real fast and prepare you for the next steps so you don't have to waste a bunch of time fumbling around the internet. Youth baseball coaching looks pretty easy from the outside looking in. But watch out, you could get eaten alive if you don't know a little bit more than the average baseball parents. If you have any questions on the course please send me an email and I will get back with you. MLB and USA Baseball just came out with new recommendations for pitchers. They also state some the reasons that pitching injuries are up. This is a must read for all folks in youth baseball today. I remember Dr. Andrews, who was one of pioneers in the ‘Tommy John’ surgery, saying what he does to the parents when they come into his office with a young son with a sore arm. He gives them a marker and a big white board on the wall and tells them to write everything their kid has done in baseball and all their accomplishments up to now. He leaves them and returns to a board full of the problem. In 12 and under baseball I don’t believe in bunting. It is certainly okay to introduce bunting at this age but in the big scheme of things it all boils down to how well one swings the bat and squaring up on the ball. Bunting is not the highest priority for this age. The kids have to swing it. If they don’t its game-over and their careers will come to a premature end with a bunch of frustration along the way. I have been coaching a youth team of 11 year olds this fall and I have not even shown or allowed anyone to bunt yet. Why? I don’t want to waste any time on stuff that will not keep kids in the game. Every at-bat in practice and games is swinging the bat. If they don’t hit---it’s Game-Over. FYI: I have my players do five pushups if they get a walk. Why? I want them to look to swing at the first available pitch around the plate. It serves no purpose to walk or bunt at this age. ‘Ya, but Dave, kids have to have a good eye at the plate.” I say, “Becoming a hitter who can consistently swing it trumps having a good eye. If a kid has a good eye but cant hit the ball out of the infield then it is Game-Over. Having a good eye at the plate can wait. The problem always comes back to the baseball parents that want to win more than develop hitters. Walks in youth baseball will help teams win games—but at what cost? The price is costly because so many kids never get a chance to develop into real good hitters and this is an epidemic around the country. Win-at-all-costs parents have no idea how they are harming kids in having an opportunity to become a good hitter. This is why I don’t allow bunting or send kids up to get a walk. Swing-it my friends—Swing-it! Unique Player Development Strategies for local organizations. Ramp Up for Next Season Now! Before you learn the baseball stuff you should really know how to build a coaching approach and style. Here is the workbook and audio CDs that will help build your foundation to manage your ballclub. I often use the measuring stick by seeing how many of your ballplayers return to play the next year. Are you helping kids to get better, enjoy the game, and build on the experiences of being a good teammate? Are you attracting players to baseball or driving them out? Are you a magnet to players or a repellent? Use this guidebook and audio CDs to study the best practices for successful youth coaches and parents. 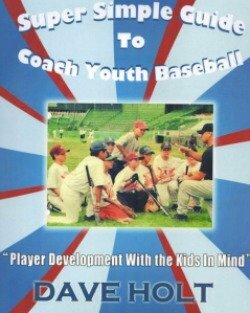 Super Simple Guide to Coaching Youth Baseball with 3 Audio CDs. Contact me anytime about anything. My most popular player development products will be on SALE for only a few more days. 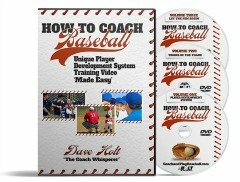 Revolutionize Baseball Coaching - 3 DVD Set NOW HERE! The 3-DVD's videos will give you and your entire youth baseball league a real live on-camera system to follow in order to properly approach youth baseball with the greatest return on investment.